Did you know that wax acts as a resist to paint? 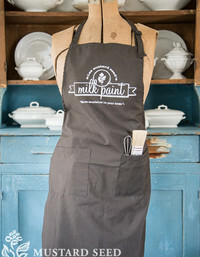 Well, it does and can be used to create beautiful layered looks with Miss Mustard Seed’s Milk Paint. This 100% natural bees wax “puck” easily fits in the palm of your hand and was custom-made for this purpose. To achieve a layered look, apply one coat of milk paint and allow it to dry. Rub the Wax Puck over the edges, corners and “high points” of the piece. Anywhere the wax is applied will resist the paint, so make sure it is applied randomly and in places where paint would naturally wear over time. Apply a second coat of milk paint and allow it to dry completely. Distress surface with fine grit sand paper or damp cotton cloth to easily remove the paint where wax was applied, revealing first coat underneath. Finish with Furniture Wax, Hemp Oil, White Wax or Antiquing Wax. This mini whisk is perfect for mixing up small batches of Milk Paint. Add water to container, then Milk Paint powder and stir out any lumps until a creamy consistency is achieved.